Six points from nine is a reasonable return from the last three matches and I don’t think anyone will argue with that. 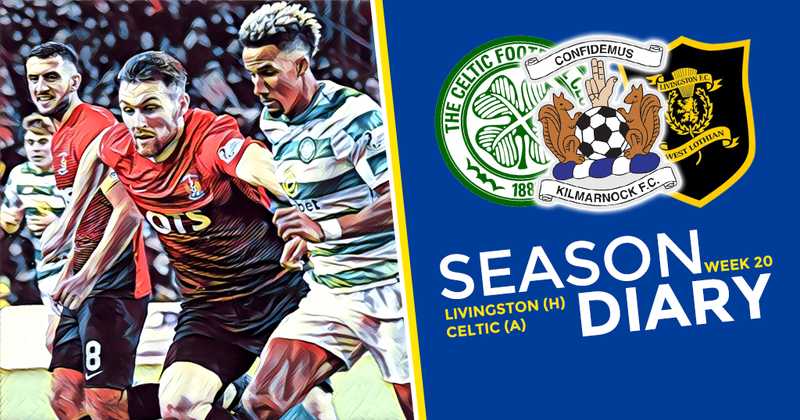 We trounced Livingston during the week and then got the same treatment ourselves on Saturday. Taking on the current champions in their own back yard is never going to be easy but with no wins against us in four so far, they were definitely out to prove something. And so it was, they were pretty much unplayable in the first half and when Jordan Jones missed the chance to equalise and they ran up the park and score their second, it was a damage limitation exercise. Gary Dicker was performing well and SOD always looks like one of the best right backs in the league, but too many of our lads were looking a bit subdued. Steve Clarke made changes at half time and steadied the ship, managing to ‘draw’ the second half, but the damage had been done and sometimes you just have to take it on the chin. Down to second place, shocking eh! Steve’s after match comments were spot on as usual, we have a small squad who have been performing at a very high level, they could do with a wee rest but there’s no real let up until the winter break. The away end sold out once more, the fans were magnificent, bring on Dundee and we go again.